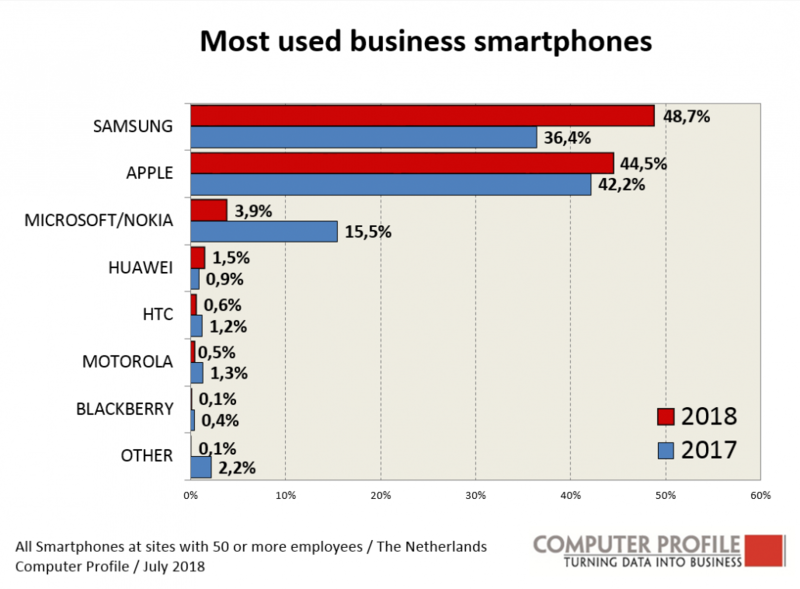 Breda, July 27th 2018 – Prompted among other things by the new privacy legislation, increasing numbers of companies and organisations are making mobile device management a standard part of their IT policy. This finding has emerged from an analysis of the market conducted by Smart Profile, which specializes in market intelligence, in which almost 5,000 decision-makers in approx. 2,500 Dutch organisations employing more than fifty staff were surveyed. Virtually all sectors saw a rise in the use of mobile device management software compared with previous years. Only the sectors for construction and transport revealed a slight fall. The reason for this may be that these sectors are in the midst of a huge economic boom, as a result of which the IT department is focused fully on meeting demand from the marketplace. More and more companies are using special software solutions to manage the mobile devices they have in circulation within their organisation. Taken across all sectors, the use of mobile device management solutions (MDM) rose from 16 per cent in 2016 to 27 per cent today. In fact, in healthcare and education, use has more than doubled compared with two years ago. At 53 per cent, the penetration rate of MDM software is far and away the highest. Interestingly, construction and transport saw a decline in the use of MDM software. 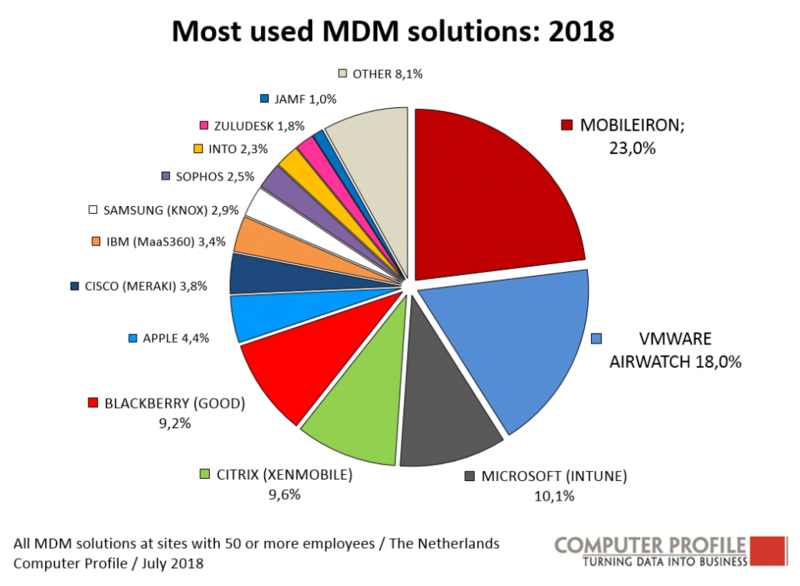 The market for MDM software is still very choppy, with many providers seeing their market share rise sharply, while others have experienced significant falls. To date, the front-runners are California-based MobileIron and VMware AirWatch, whose respective market shares are 23 and 18 per cent. However, Microsoft Intune (10.1%), Citrix XenMobile (9.6%) and BlackBerry Good (9.2%) are not far behind. Because while the share of the first two providers slightly fell (MobileIron from 32 per cent in 2016 to 24,9 per cent in 2017 and 23 per cent today, and VMware from 20.1 to 18 per cent over the same period), Microsoft and BlackBerry in particular made gains. Microsoft went from 0.5 per cent in 2016 to 10.1 per cent now, and BlackBerry from 5.2 per cent in 2016 to 9.2 per cent today). Apple also saw its market share drop, from 7.8% in 2016 to 4.4% now, while a whole series of vendors have carved out a position for themselves on the market in the past two years. Cisco Meraki (3.8%), IBM MaaS360 (3.4%), Samsung Knox (2.9%), Sophos (2.5%) and Into (2.3%) all have over two per cent of market share. When it comes to the business smartphone market, the cake is divided up into a good deal more slices. Apple and Samsung have been working on the service together for a few years. Worthy of note is the fact that this year, Samsung’s market share (48.7) overtook Apple’s for the first time (44.5%). By contrast, Microsoft/Nokia* have now permanently hung up. In 2016, Microsoft still had its highest market share of 20.5% in the business smartphone market, although that has since fallen, first to to 15.5 per cent and 3.9 per cent now. Of the other players in the market, Huawei was the only smartphone brand to see its share rise a little, to 1.5 per cent. The other makes have all seen their share drop below one per cent (HTC 0.6%, Motorola 0.5%, BlackBerry 0.1%) and as a result are likely to leave the stage. 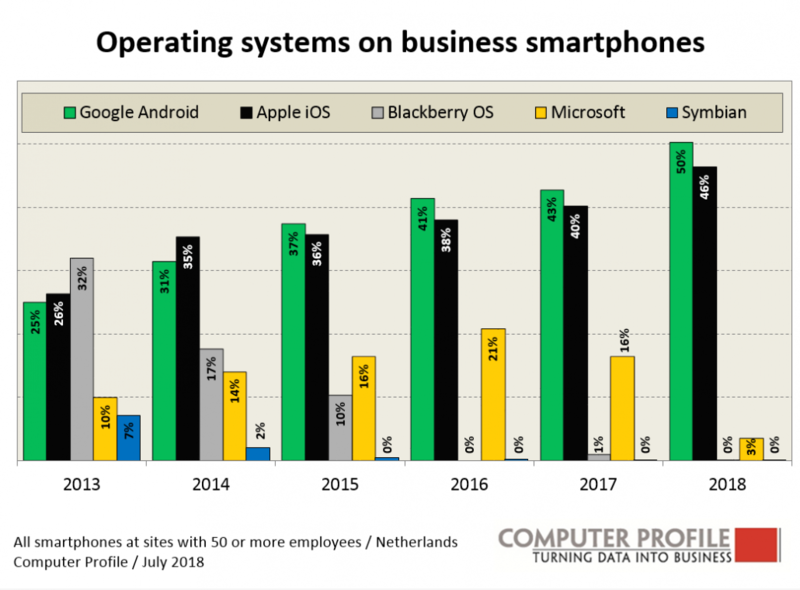 In the area of operating systems for business smartphones, the market reflects a picture that is keeping pace with the position of the various smartphone manufacturers. Google Android (50%) and Apple iOS (46%) share the market between them, while the penetration of Windows operating systems, following on from BlackBerry and Symbian, has been reduced virtually to zero. * Until last year, Microsoft had taken over all of Nokia’s smartphone business. This year, Nokia is stated as an independent label in the analysis as a separate manufacturer.